Compensating passive probes increases the accuracy of your measurements by matching the capacitance of your probe to the capacitance of a particular oscilloscope input channel. Configure a panel and layout in InstrumentStudio to include your oscilloscope. For more information on using InstrumentStudio, refer to the InstrumentStudio Manual. The PXIe-5110 can output a 1 kHz square wave that you can use to compensate passive probes. Connect the BNC end of the probe to an input channel of your oscilloscope. Connect the ground clip of the probe to the ground terminal on the front of the oscilloscope. Contact the tip of the probe to the 5 V square wave terminal on the front of the oscilloscope. The probe compensation signal at this terminal is activated by default on the PXIe-5110. You can disable and re-enable the signal in InstrumentStudio with the Probe Compensation options in the instrument header menu ( ) in the upper-right corner of the panel or programmatically in NI-SCOPE with Probe Compensation Signal Stop and Probe Compensation Signal Start. In InstrumentStudio, configure the settings of the input channel to which you connected the probe. Set the channel to On to display the signal. Set the Input impedance of the channel to 1 MΩ. Set the Vertical offset to 2.5 V.
Match the Probe attenuation setting to the setting on your probe. Adjust the vertical range on the input channel until the signal starts to clip and then increase the vertical range by one step so that it no longer clips. This process ensures you are using the maximum dynamic range of the ADC. 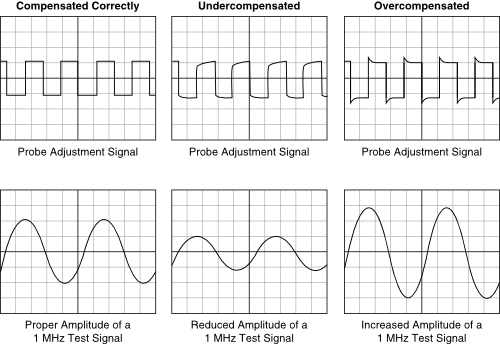 Once compensated, the probe conveys signals to the input channel accurately, without artificially attenuating or amplifying frequency components of the signal.